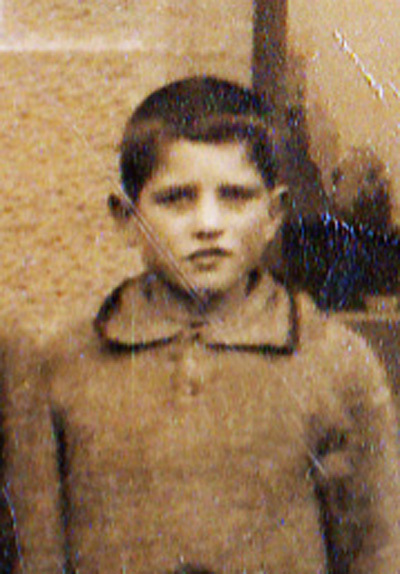 Alfred James Coutts, Alf or Alfie to his family and friends and Dad to me was born on 30 May 1914. I thought I would write a little bit about him to mark what would have been his 100th birthday. 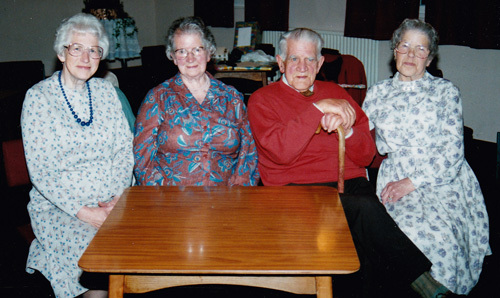 Alf's early years were in River Street in Brechin where he lived with his Mother Maggie, a single mother, and his sister Minnie, two years older than him. Minnie would recount to me how she was often put in charge of her little brother, in the street or in the berry fields in the summer. By all accounts Alf was a wee rogue, but he had an ingratiating smile. While Minnie was slaving away picking berries to earn some much needed cash for the family, Alfie would be playing around. How it irritated her to have to look after him and to get no credit for it. Alfie would just turn his blue eyes up to the ladies he met and smile, earning him a pat on the head and the comment, "Affa fine laddie, Alfie!" People liked him, and that continued through his life. It came as quite a surprise to me a couple of years ago to discover that I was now living just a couple of miles away from where my father was born. I think I knew as I was growing up that Dad had been born somewhere north of Aberdeen, but I always associated him with Brechin. 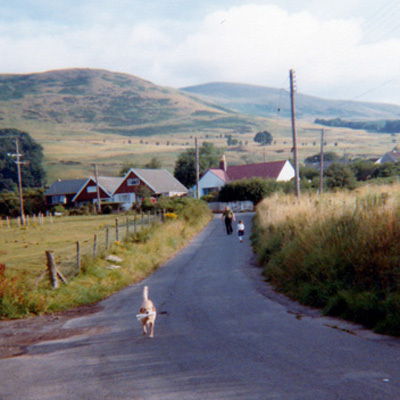 When I took possession of his papers after he died I noticed that he was indeed born in Slains Parish, Aberdeenshire, at a place called Moss Croft. An examination of some maps let me find the croft, a place within sight of Hatton, where I now live. It was a strange experience standing beside the derelict house which was probably where he was born nearly a hundred years before. The world was very different place that spring of 1914. Maggie, his mother would have no inkling of the war that was to come by the time her newborn son was months old. 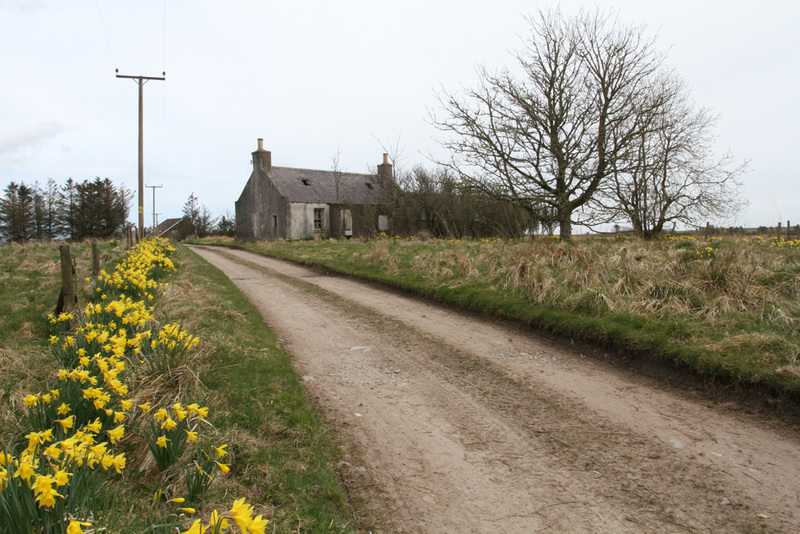 In Slains, Maggie was far from where she had been born and brought up, in the parish of Craig, near Montrose. According to the 1911 Census, the 24 year old Maggie was at home looking after her elderly widowed father, John, who was a crofter at Woodside of Rossie, in Craig. He died on 7 July that same year, aged 70. 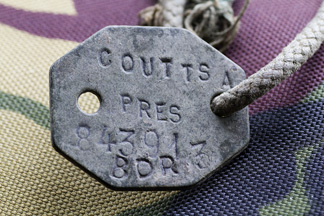 It can be quite an emotional experience reading old documents, and my great grandfather, John Coutts' death certificate certainly brought a lump to my throat, as it told of his death after 9 days, as the result of internal injuries caused by an accident with a "trap". Was it a pony and trap or a rat rap or what? After the death of her father, Maggie would had to find work, and that might well have been what took her north to Aberdeenshire. According to Alf's birth certificate, his mother was a "domestic servant" and she was probably moving from place to place. We know she was in the village of New Pitsligo (not all that far from Slains) in 1912 when Minnie, Alf's older sister was born. By spring of 1914 she was at Moss Croft, in Slains, and two years later, in September 1916, she took Alf back to Craig, In Angus to be baptised. 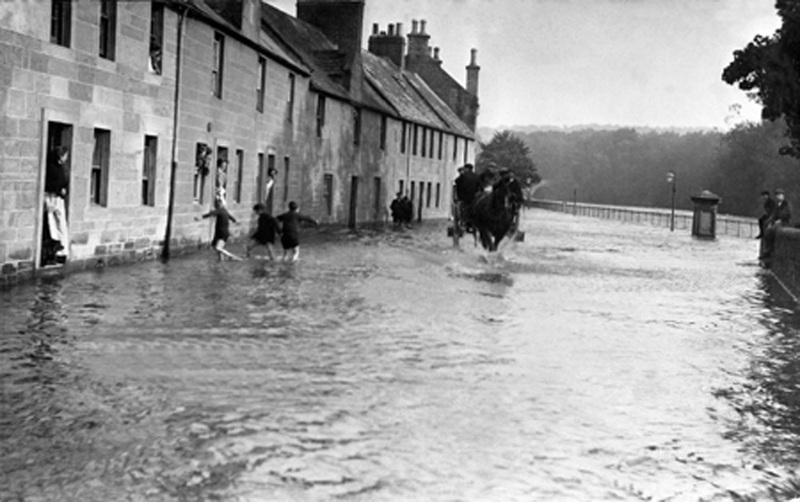 Was this when she moved to River Street in Brechin, which became the family home for Maggie and her two small children? I do wonder if the ravages of the Great War which was raging at the time had some influence on the move from Aberdeenshire back to Angus. I know that Maggie would later recount her memories of the awful telegrams which would arrive and how a "missing" husband, son, brother, meant "dead". But more of that later. 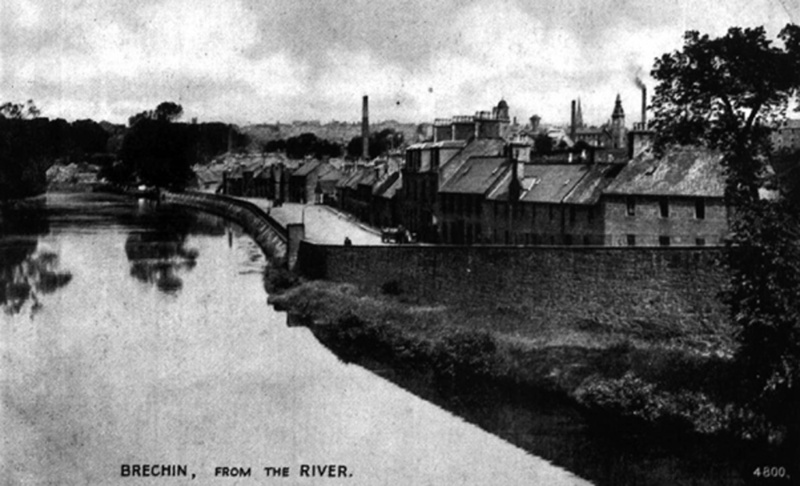 My father used to paint an idyllic picture of his childhood, growing up in River Street in Brechin. He attended Andover School, just up the "Muddy", a steep path that ran up a grassy bank between River Street and Montrose Street. By all accounts he did well at school, but education had to end for him at age 14 so that he could go to work and help support the family. Maggie also sent him to Sunday School at Maisondieu Church on Witch Den, and I am sure I once saw some evidence of how well he had done at Sunday School. 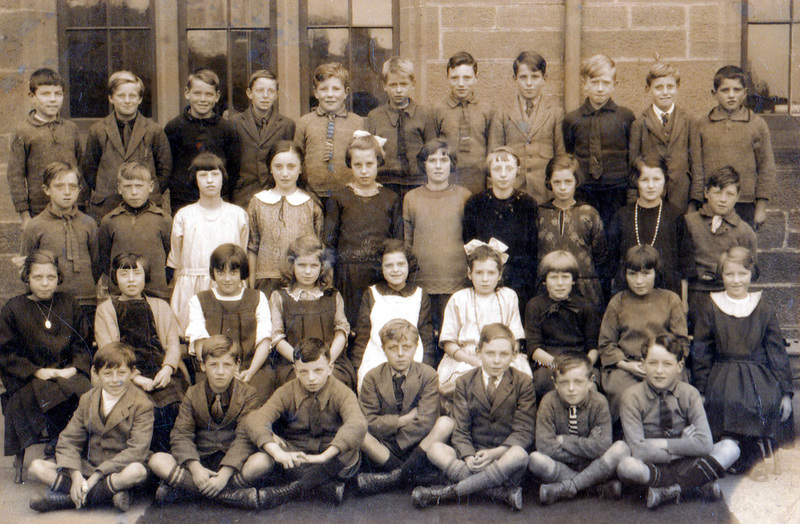 Class at Andover School, Brechin. Alf is at the right in the back row. 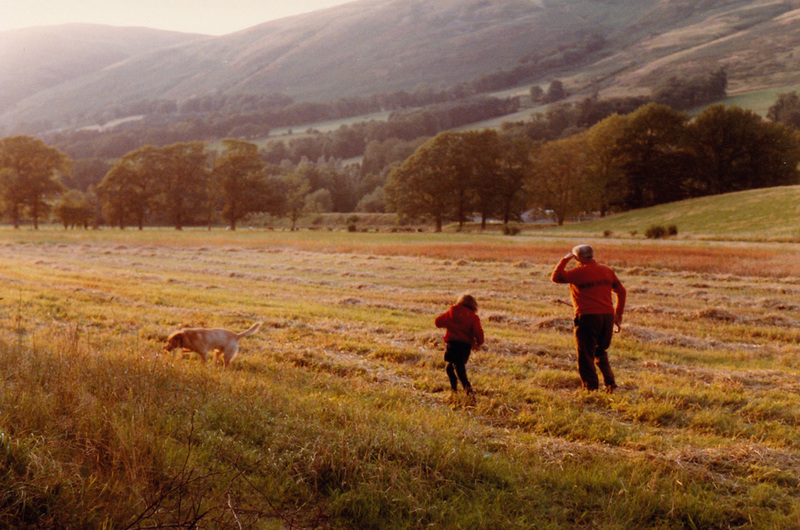 But what Alf remembered and would often tell the family, was the joy of running free with a gang of wee urchins, with the "Hilly" woods on his doorstep and of course the river, the South Esk right across the road from the house. 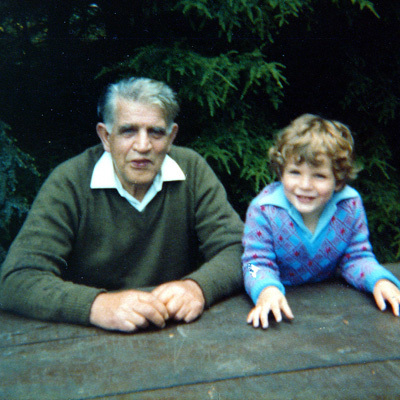 He loved to tell stories of playing in the river, learning to swim beside the nearby weir and jumping in from the base of the pillars of the old Brechin Bridge. 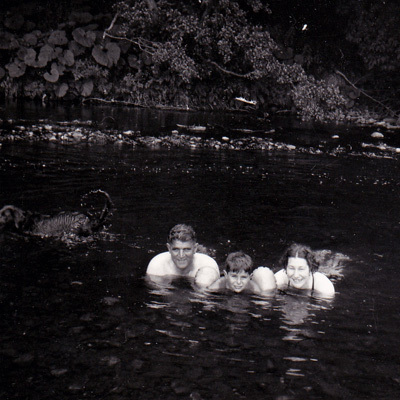 No swimming costumes in those days, and you dried yourself with your shirt. His mother was well aware of the dangers, but how to control the wee boy? One of Alf's favourite stories was about the summer day he returned home to be challenged by his mother: "I thought I told you to stay away from the river!" Fine laddie Alfie put on his innocent face as he protested that he hadn't been near the water. "Then why's your sark on the wrang way roond?" He did not record what happened next! The River seemed to dominate his early childhood, not least with the floods that brought the water right over the road and into the houses. This seems to have been a regular occurrence. Alf would tell of his mother having to move the family up stairs in the flood, but he also told of an earth floor in the house so that when things dried out life could resume. All his life my father hated chicken. I wonder if this goes back to his first job? He was employed to work at Findowrie farm, just outside Brechin, to work with their flock of hens. I remember once, when I was a boy, he took me to see the hen houses where he had worked before the Second World War. He never said very much about the work, but he did recall cycling the four and a half miles there and back each day, cycling home for his dinner too, and it was all uphill from River Street.His bike, however, did get him into trouble with the law. He never told me, but I came across a tiny mention in the Dundee Evening Telegraph of an Alfred Coutts of River Street in 1929 who was fined the sum of 2 shillings and six pence (half a crown - a great deal of money) for riding his bike without lights. He would have been about 15 at the time. 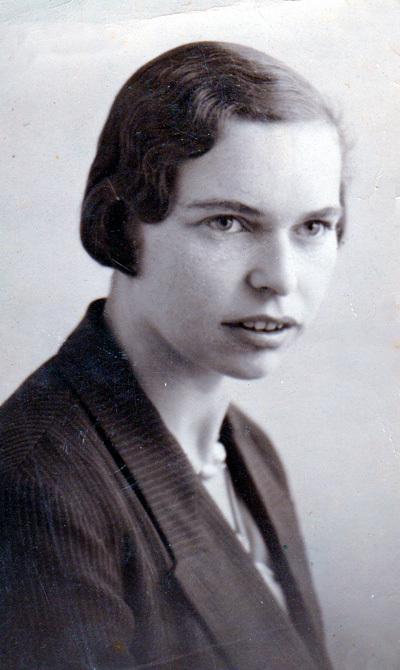 One young woman who certainly did find Alfie "affa fine" was my mother, Agnes "Nan" Smith. I remember her telling me how she met this handsome young man with bright blue eyes at a dance at Memuir Hall. This must have been in the early 1930s. 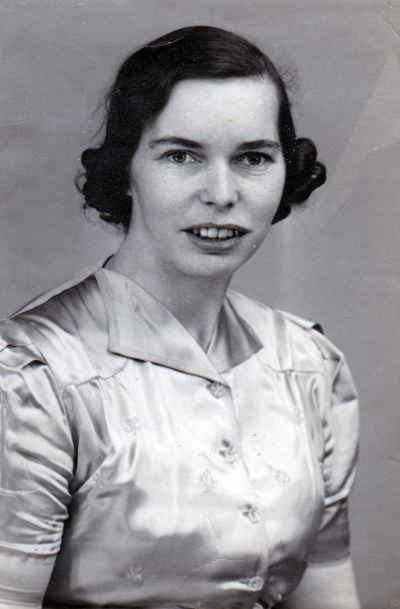 Nan had left school aged 14 and gone into service. 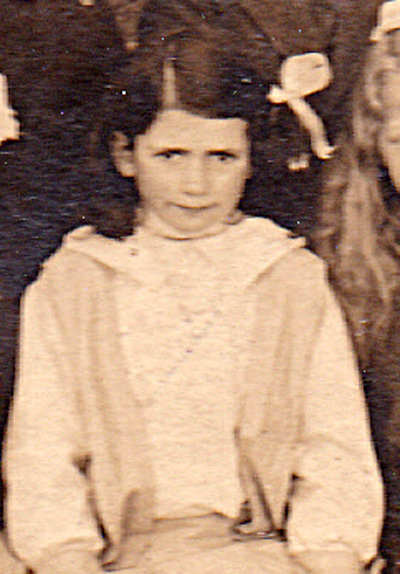 Thanks to a collection of old postcards she kept I know she had been a maid in the South Manse in Edzell in 1932. By 1935 she was working at Westmuir Farm outside Brechin. I am sure that it was while she was at Westmuir that she met the laddie who looked after the hens at the next door farm of Findowrie. It is round about this time that the mists of obscurity come down again. 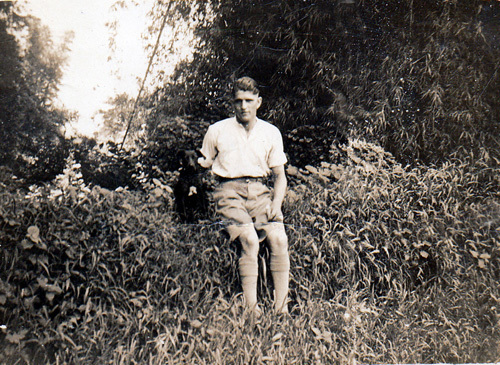 Sometime in the early 1930s Alf left Findowrie and moved to the East Riding of Yorkshire, somewhere near Hornsea. In older life he would talk about knowing Horsea and the cliffs there. I had assumed that this was in his army days, but my Auntie Muriel (my mother's youngest sister) cleared things up for me. He had moved to farm work there, possibly looking for a better living in those days of the depression. This is a part of his life I know nothing about, other than the army seemed to describe him as a "poultry farmer", so I guess that he was working with hens in Yorkshire too. Muriel said that she did not know what happened there, but something clearly did not work out and the next thing we know is that Alf has signed up. I have his Army records and see that he went to Hull and enlisted in the Royal Artillery on 13 February 1935 for six years. Clearly the romance was flourishing despite the distance. 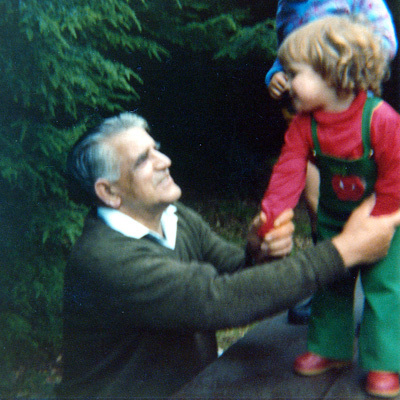 There is a pair of photographs of the time with Alf in his Army uniform sharing a frame with the girl who would eventually be my mother. Nan had agreed to wait for him when the army posted him to India. It was at this time, while Alf was in India that she moved from Westmuir to take up a position with her friend Cathie in Northwood in Middlesex. 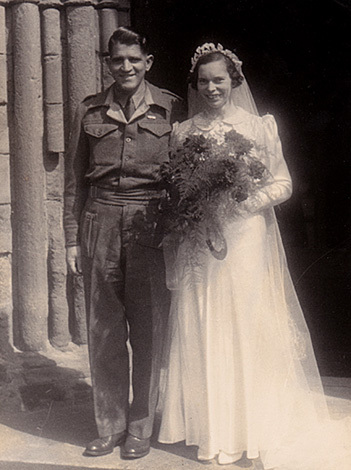 In the end, it was 9 years after he sailed off to India, not until 1945 that the couple managed to meet up again and marry because of Alf's war service and his time as a prisoner of war. Alf and Nan about 1935. Note the spurs! 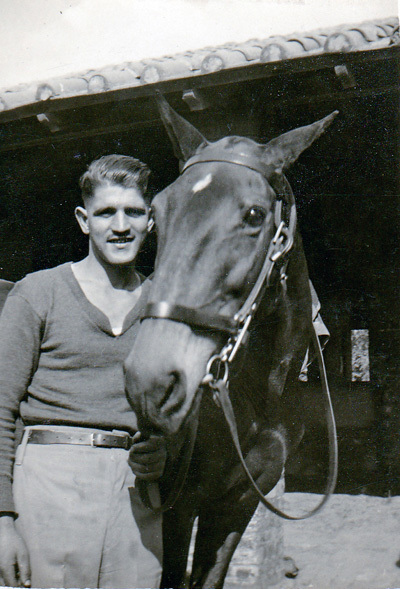 Alf's time in the army was the formative period of his life and his military bearing was obvious in many a photograph. 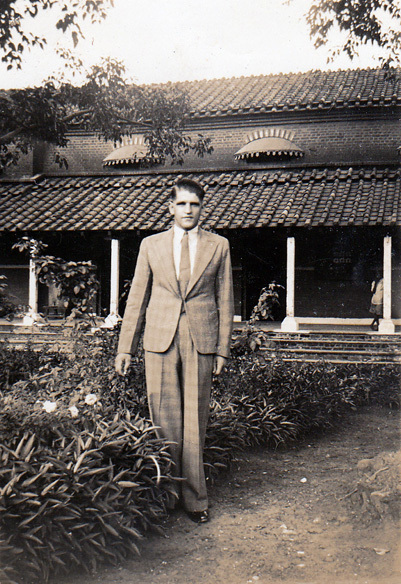 He would often talk about it, recounting stories of his time in India, of army life, but not the war. Three stories of his early time in the army come to mind. When he was asked why he did not join a Scottish regiment, with a smile on his face he would say he didn't want to wear a kilt. 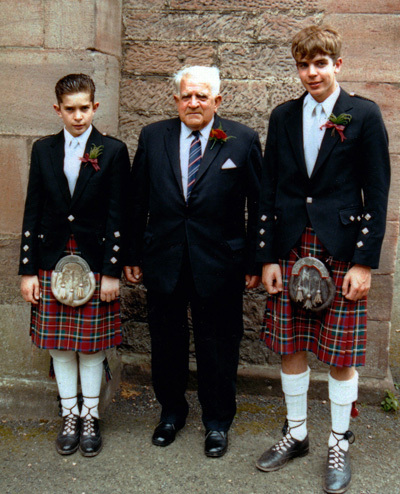 And he never did, even in his time as sergeant major in the Army Cadet Force in Brechin, or later at family weddings when kilts became the usual dress for men. Alf would tell us that he learned the first rule of army life as a new recruit doing his training at Colchester, never volunteer. In those days the Artillery was still using horses to pull the guns. The new recruits were lined up and the sergeant asked if anyone came from a farm background. Alf said he did, expecting to be immediately put in charge of a horse. Not so, he was immediately given a pitchfork and brush and told to muck out the stables! Gunners had to look after their horses. This picture was probably taken in India. Gunners would ride the horses as they pulled the guns and their uniform took account of this: breeches, putties and spurs. The young gunner cut quite a dashing figure in his riding uniform, but he said the spurs were a real problem when you tried to come down the stairs in the trams. 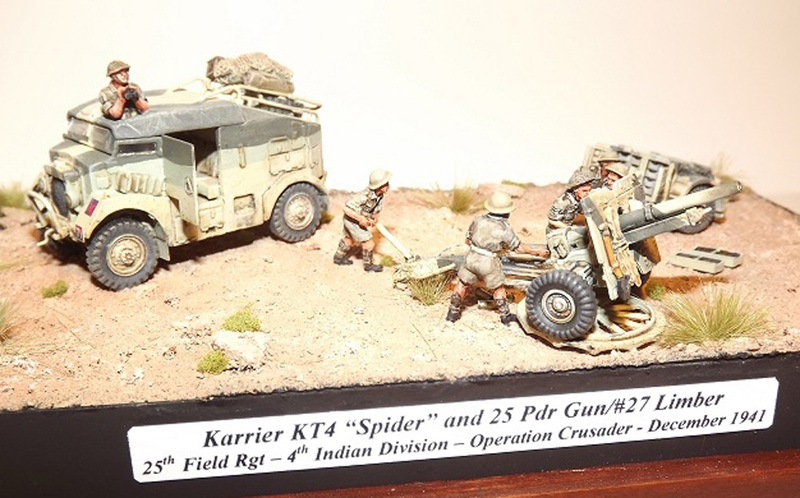 In 1938 while in India his battery was "mechanised" and they traded in their horses for what was described as rather ancient Albion lorries, later replaced by Karrier Spider gun tractors when the unit arrived in Sudan on war service in 1940. Alf never sat a UK driving test. He was of the generation who would simply apply for and be awarded a driving licence. Some of my aunties would comment on his driving in his older years. He was not a subtle driver, they would say it seemed he still felt he was driving a ten ton truck! The bare bones of Alf's army career are contained in his army records, but he kept his own minimalist record in the front of the soldier's New Testament with which he had been issued and clearly kept with him right through his time in the army and as a POW. Dates and places are there, up to the stark entry on 3 September 1939, WAR (underlined). After that just the two entries, recording his voyage with his regiment from Bombay to Port Sudan (on the Troopship Nevasa) and on to Haiya Camp near Khartoum; then nothing. Was it a question of security, or had real fighting taken up his attention? I get the feeling that his time in India had been like playing at being soldiers, training, sports and the daily routine of looking after the horses. How much of India he actually saw as a humble Gunner, I will never know. What I do know is that I should have spoken to him more about it. But what has been fascinating for me is tracing the names of the places recorded in his book and seeing what they look like now. He used to brag about being a good sailor and would love to recount how other soldiers turned quite green on the troopships when it was stormy, while he smiled and kept going. He would tell us too that he used to be the caller for games of "Housie, Housie" (Bingo) on board ship, never losing money, but letting others pay him his fee for doing the calling. It was also on a troop ship that he learned to loath a particular song. The record collection on board must have been quite limited and one song was played over and over again: "Oh Johnny, Oh Johnny how you can love!" by the Andrews Sisters, I think. I used to think this was during the voyage to India in 1936, through the stormy Bay of Biscay, on the Troopship Somersetshire, but I notice from the date of the record it must have been later than that. 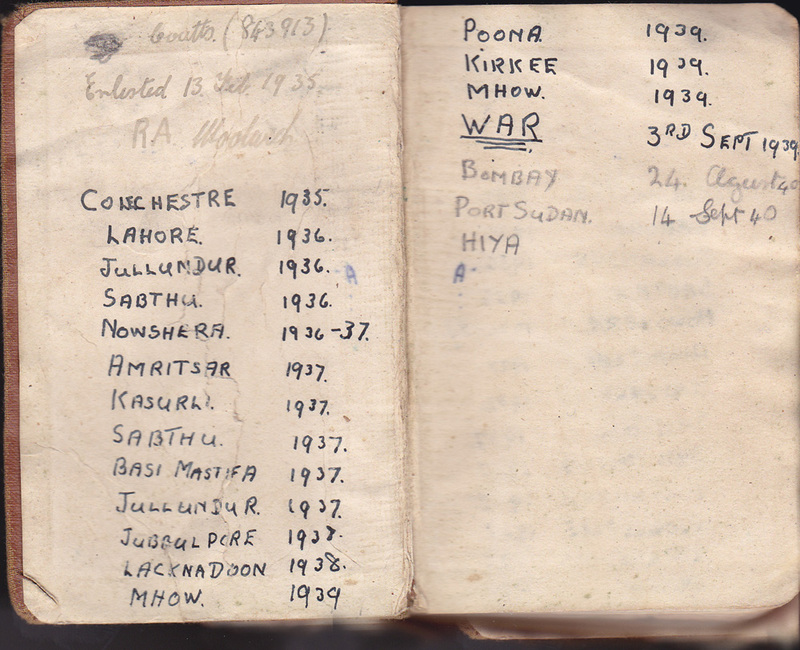 I expect it was on the journey to war from Bombay to Port Sudan in 1940. My mother's youngest sister, Muriel, was always writing to radio programmes and she sent in a request on his behalf to Radio Luxembourg, to a programme which Bob Monkhouse presented in the 1950s called "Smash Hits". He would play, one last time, a record that a listener hated, then "smash it" with elaborate sound effects on air. That was the final fate of "Oh, Johnny!" 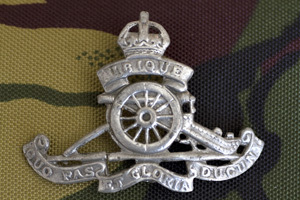 While in Jubbulpore in India there was a major reorganisation of the Royal Regiment of Artillery and Alf's battery became A Troop of 1/5 Battery, 28th Field Regiment RA (The Blazers). The regiment became part of the 5th Indian Division with whom they fought throughout the Second World War. 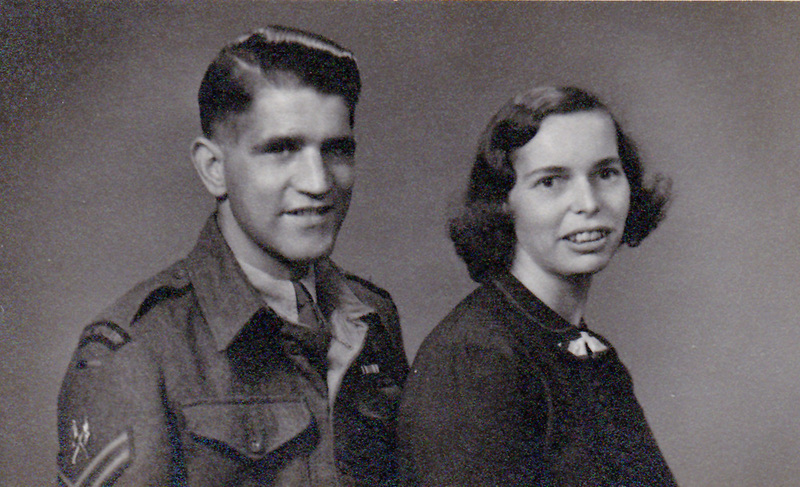 It was only after my mother died that my father spoke more to me about his war experiences, but still very little. What he did say was how shocked he had been when his Battery was firing in earnest against the Italian Army, and the Italians fired back! This was not what the Gunners had been expecting. He had trained as a signaller and would be sending messages back to his Battery using Morse code, or running long lengths of telephone wire. 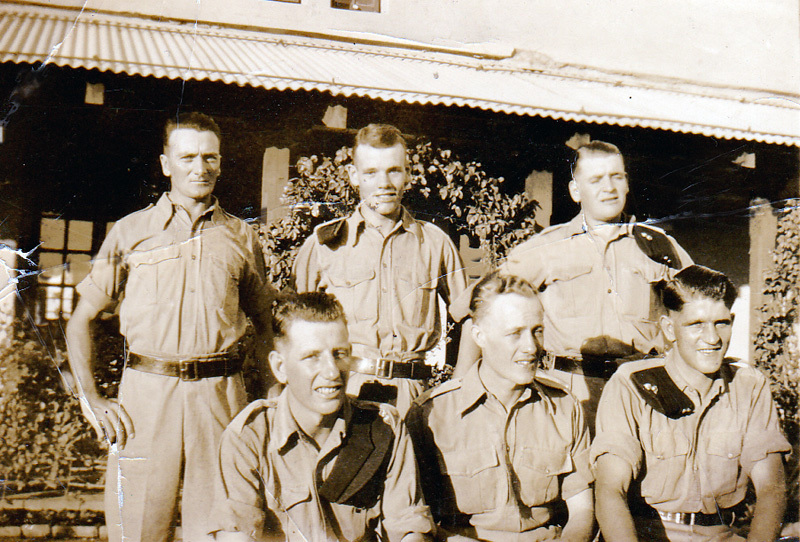 The service of his regiment against Italian forces in Sudan, Eritrea and Abyssinia is well documented on the Internet. 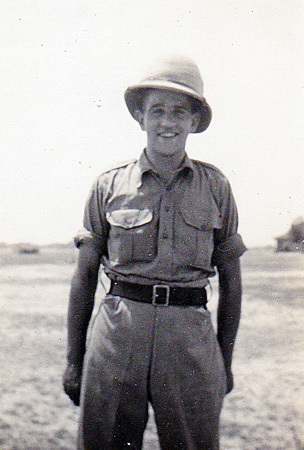 Alf's regiment in East Africa was attached to Ten Brigade, then under the command of Brigadier Bill Slim, who later became famous in the Burma Campaign. 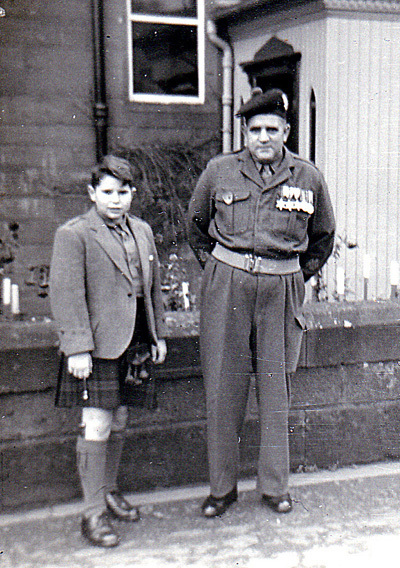 Bill Slim was by all accounts, a soldier's soldier and my father clearly had a great respect for him, having served under him. As a parting gift from the Brechin Cadets in 1961, he asked for a copy of Slim's book, "Defeat into Victory" and I can still picture it, right up his death, on the shelves of the sitting room bookcase. 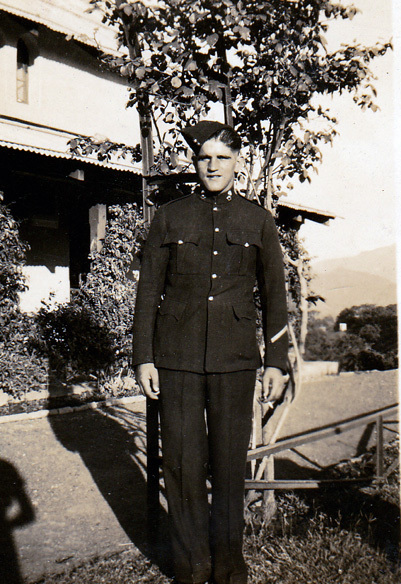 My father would mention from time to time places where he served, but never in any strict order. He would often talk of the troopship sailing through the Suez canal, like a ship sailing across the desert. He would also speak about Iraq and the crude oil bubbling up through the soil which the locals used to make up roads. The places that he would mention have become much more familiar because of the recent Iraq wars. The 5th Indian Brigade was sent to Iraq in 1941 after the Anglo-Iraq War, but were soon recalled to the Western Desert. Thanks to information posted on the Internet I have been able to flesh out the outline of Alf's war service in his army records. Sudan (3 months), Eritrea (4 months), Abyssinia (5 months) Egypt (1 month), Iraq (3 months) Cyprus (3 months), North Africa (4 months) where his unit was caught up in the terrible defeat in Libyan desert at what was called the "Knightsbridge Block", near Tobruk. 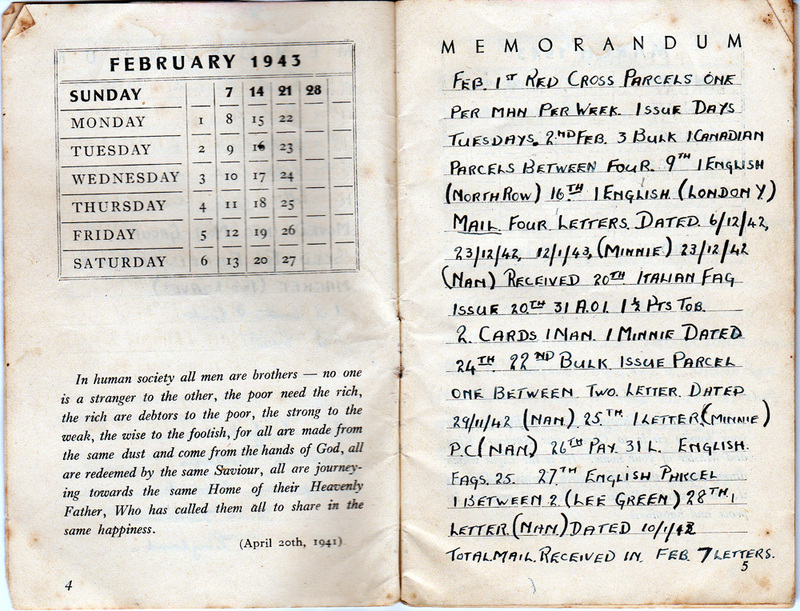 From the POW camp in Italy Alf wrote a brief note in a little diary booklet given to prisoners by the Pope. 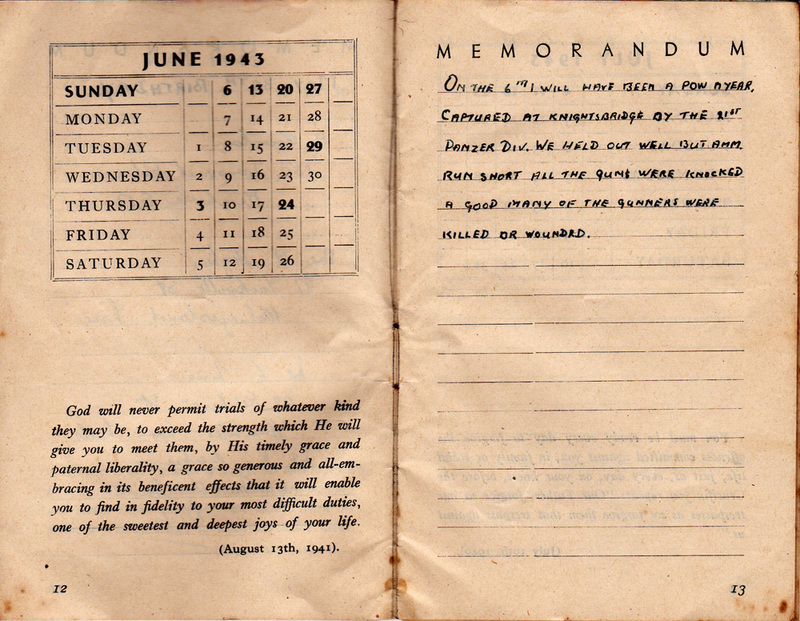 On the 6th [June 1943] I will have been a POW a year. Captured at Knightsbridge by the 21st Panzer Division. We held out well but amm. run short. All the guns were knocked. A good many Gunners were killed or wounded. This was part of the Battle of Gazala where an attempt was made to hold back Rommel and allow the 8th Army to withdraw and regroup. 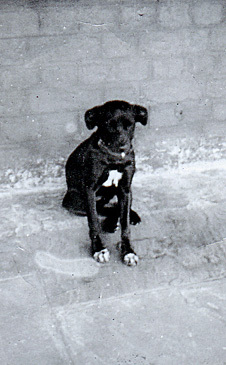 He was captured on 6 June 1942. On 30 June his mother was notified that he was missing. She died on 7 July from a heart attack, aged 55, devastated that her boy was missing. She remembered how "missing" in the previous war meant "killed". Sadly she never knew that Alfie was a POW. 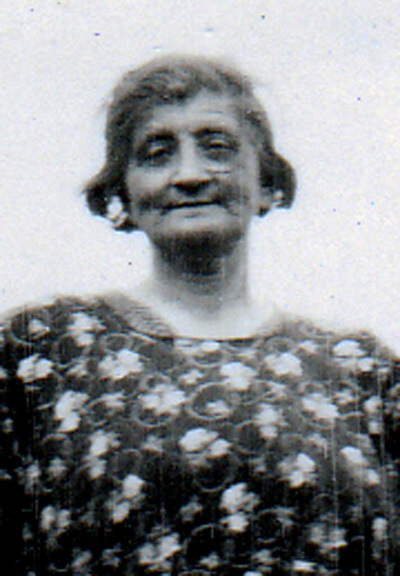 It was a month after her death before the news reached Brechin that he was a prisoner in Italy. Alf arrived in Italy at Naples and was first confined in a nearby transit camp, PG 66. The Italians had taken charge of all the POWs from North Africa and by all accounts had vastly underestimated the numbers involved. Conditions in the camp were not great, and only the arrival of Red Cross parcels kept the prisoners in a tolerable condition. In September he was transferred north to PG 54 at Fara in Sabina, twenty miles or so north-east of Rome. The camp housed 4,000 lower-ranked British, South African and Ghurka prisoners, mostly from the surrender of Tobruk, held in two compounds of tents, with very poor conditions and food shortages. 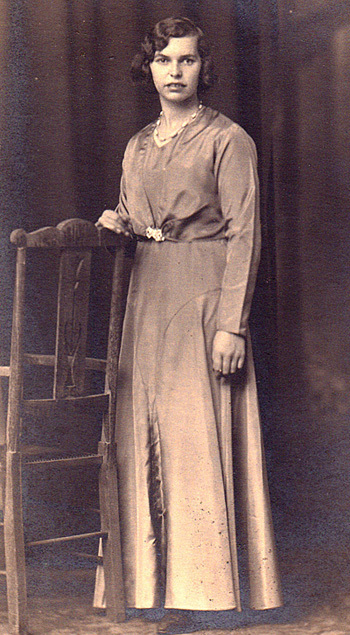 By now Nan had returned to Brechin from Northwood and was working in a local engineering works. 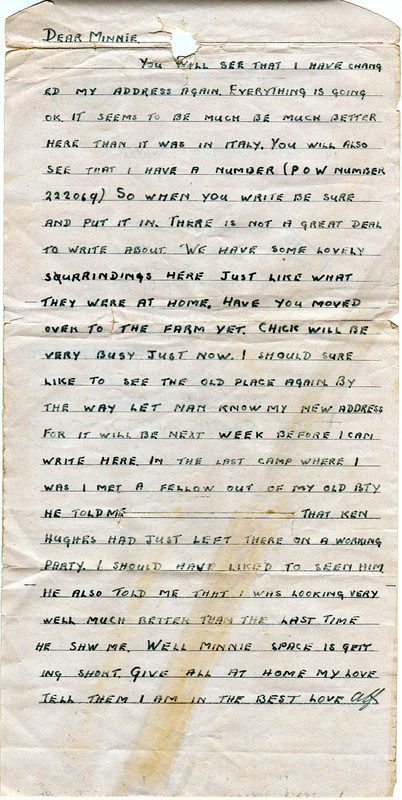 She and Alf's sister Minnie, became friends and would send letters and post parcels to Alf in the POW camps. It is fascinating to read his brief notes from the Italian camps, recording the arrival of cards and letters and parcels, sometimes even the contents of the parcels. He also recorded home addresses of soldiers he met there, but none of the names mean anything to me. He also must have been involved in some education, for there is a page of information about electricity, like Ohm's law etc. My father never said very much about life in the Italian POW camps, other than to express his low opinion of the Italians and his desire never to go back there! Italian food was also a no go area for him in later life. The only story I recall is how he recounted selling once-used tea leaves, dried out in the sun to the guards, telling them it was the best English "Sunkissed Tea". I have been reading about an instruction given to senior officers in Italian POW camps when the Italians surrendered in September 1943. They were told to ensure that the 80,000 men stayed in their camps until the 8th Army reached them after the invasion of Italy. This allowed the Germany army to move the POWs to Germany and Poland. I had wondered if my father's two years in German POW camps could have been avoided had this order not been given. However a closer look at the dates shows the question would not have arisen, for the prisoners from PG 54 were put into cattle trucks by the Germany Army in July and moved by rail north to Germany, a good two months before the Italian surrender. 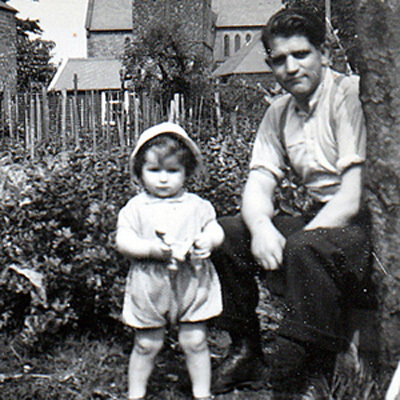 So began my father's incarceration in German camps. 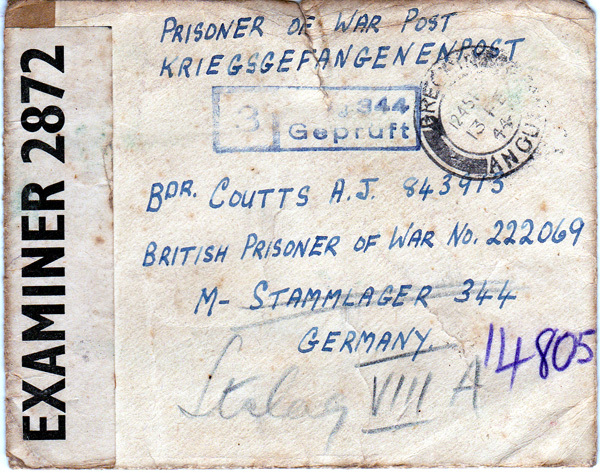 His first camp was Stalag IVB near the small town of Mühlberg in Saxony. On 28 July he wrote to his sister telling her that conditions were better there and people were telling him he was looking better. I wonder what sort of condition he had been in during his time in Italy? Rather quaintly he wrote, " We have some lovely surroundings here, just like what they were at home.......I should sure like to see the old place again." I suppose that the countryside in Saxony was much more like Scotland than it was in Italy. 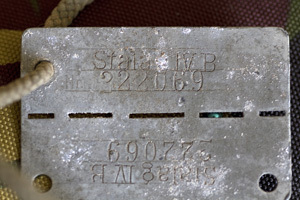 By the end of August he was moved to Stalag VIIIB (later renumbered 344) at Lamsdorf (now in Poland) and 7 months later, in March 1944, he was moved to Stalag VIIIA at Görlitz (also now in Poland), which had originally been a Hitler Youth camp modified for POWs. He spoke very little about the German camps; the only thing I recall were horror stories about makeshift dentistry involving a foot powered drill and fillings made out of silver foil from cigarette packets. 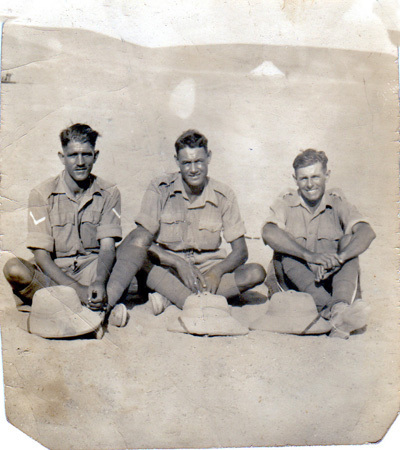 The silver foil must have been useful, for he brought home with him a Royal Artillery badge cast out of melted foil made in one of the camps. 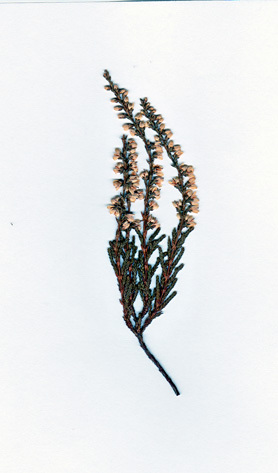 The only other thing I have is an envelope of a letter sent to him by his sister in February 1944, rather touchingly containing a spring of dried white heather. The final stage of his time as a prisoner must have been awful. On 14 February 1945 the Americans and British prisoners from Stalag VIIIA were marched out of the camp westward in advance of the Soviet offensive into Germany, one of the so called hunger marches. Hundreds of prisoners in small groups were marched through one of the coldest winters on record, living off the land as they went. My father spoke very little about this time, other than to say that he managed to "acquire" a knife, fork and spoon for his use, from an abandoned German house. My mother used the spoon for many years for cooking. It had the initials GF on the handle, and she said how appropriate it was: that was her grandfather's name, George Fraser. It was during this time that Alf's poultry keeping experience came into good use: he knew how to catch a hen and wring its neck, to give at least some of the prisoners a meal. Two months of relentless bitter hell. No wonder he did not speak about it. 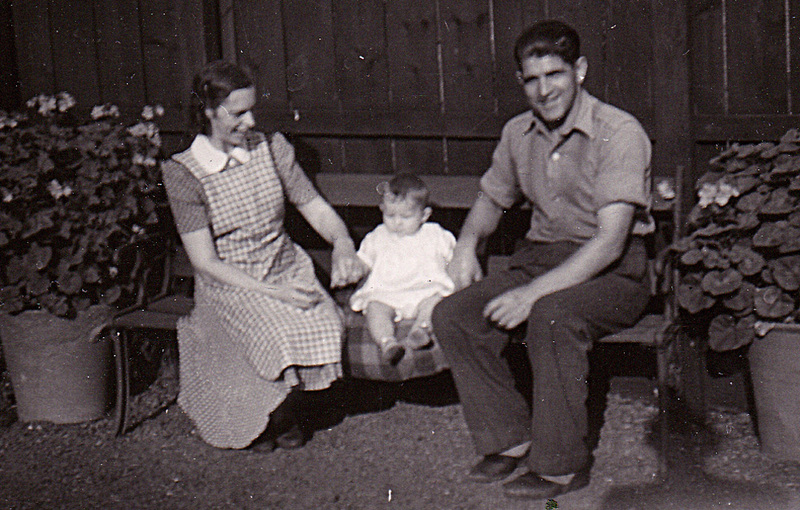 My mother told me of the awful physical and psychological condition he was in when he did make it home, despite the smile on the photographs taken when he came home. She also spoke of one prisoner that Alf had looked after and kept alive through the long days of marching. I recall Christmas cards arriving every year from somewhere in England, from someone who was not family. I am sure it must have been him. The march came to an end when his group were "liberated" by the Americans, somewhere in the north of Germany. Quite what happened next I am not sure but my father spoke of "hitching a ride" back to England on a Douglas Dakota aeroplane, the first and I think the only time he flew. 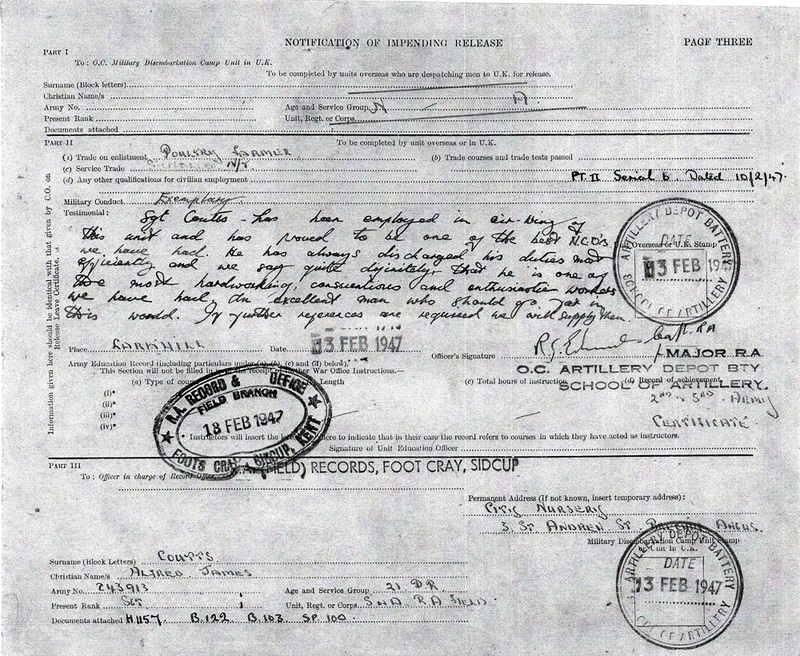 His army records simply state that he "ceased to be a POW" and returned to the UK on 22 April1945. VE (Victory in Europe Day) was 8 May. He and Nan did not put off time. They had waited so long from when he sailed off to India in 1936. 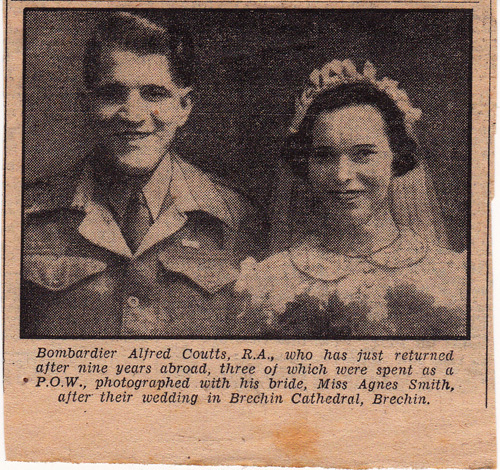 The couple were married in Brechin Cathedral on 18 May and spent their honeymoon in a bitterly cold Aberfeldy, before Alf had to report back to the Army, first to Fonthill Barracks in Aberdeen. The Army had now to post him to a new regiment since his own regiment had returned to India after the North African Campaign. Exactly where he served out the last two years of his army service is not clear from his records, but he seems to have been involved in training, was promoted to Sergeant and continued to be a signaller, including attending courses. There is reference to my mother, now his next of kin, living at Jersey Marine, near Neath in South Wales, and she would speak of them living in Wiltshire, when he was on his final posting to the Royal School of Artillery at Larkhill, near Salisbury. It was from there that he was finally demobilized from the army in 1947 just a few weeks after I was born in January of that year. 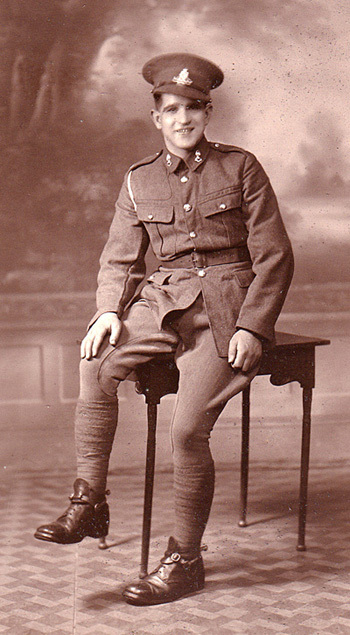 And it was the Commanding Officer at Larkhill who wrote a glowing reference for my father, referring to him as "one of the best NCOs we have had........He is one of the most hard working, conscientious and enthusiastic workers we have had, an excellent man who should go far in this world." Alf's Army dog tag and his medals. And so started a new stage of Alf's life as a civilian again and a family man, the couple's only child, Fred being born in January 1947. It was now that he became Janitor at Brechin High School and he learned the trade that he would serve for the rest of his working life. What opportunities it gave me as a wee boy to explore the dark secret places of the school buildings and go and help my Dad at work. And work he did! Long hours, looking after boilers, supervising cleaners, anxious about frost. His role as janitor also required him to act as school truant officer, or as he used to describe it, the "whipper-in", searching out truants and getting them back to school. He was even issued with transport to help him cover the length and breadth of Brechin - a bike! 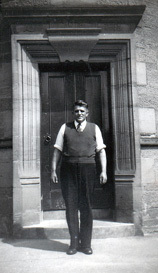 Alf in his Brechin Janitor's unform, standing at the gate of the Smith house in St Andrew's Lane. This was the High School building at the time. 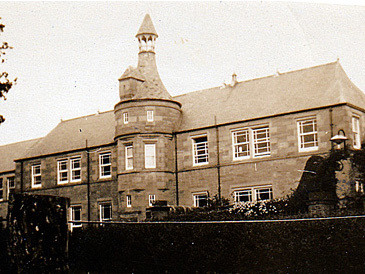 Our house in Brechin was the gallery of what had once been a church and now was the school gym - Gym House, Maisondieu Lane. Living above the gym I would borrow the keys from time to time with my cousin or my pal and we could play in the gym when no one else was around, using all the equipment. His army training had given him a fine loud, commanding voice and many a delinquent pupil would hear him encouraging them to better behaviour. Then there was his cart, especially designed to move crates of the tiny milk bottles that school pupils got daily in those days. I remember collecting left-over milk and taking it to my Granny for her dog to drink. The perks of being a Janny! He worked long hours, even on Christmas Day, but there was always time for the Cadets. He was the sergeant major in the Brechin company of the Army Cadet Force, sharing with the boys his many years of military experience. I remember how he would always come home from the week-long summer camp with no voice at all....his parade ground voice had been over used. He was offered a commission, but he felt that was not for him. He had been an NCO in the regular army and he felt that was his true place. 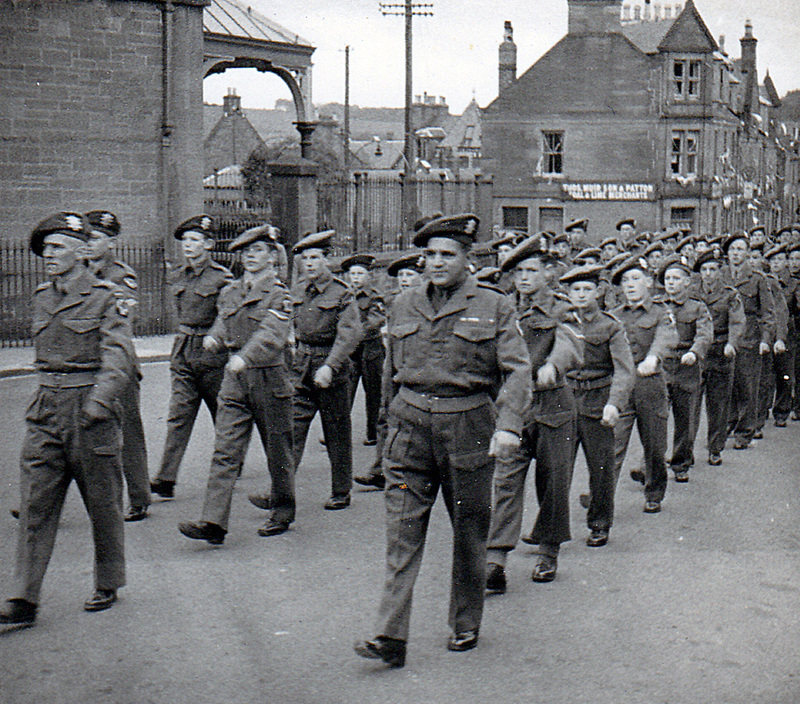 Sergeant Major A J Coutts in a Army Cadet parade, passing Brechin railway Station. Perhaps on the occasion of the Coronation in 1953. The cadets gave him an experience that was most unexpected. The Angus cadets had a training camp in Glen Esk, at Dalbog. You had to cross the Pierpoint Morgan footbridge over the River North Esk to get to it. He would attend regular weekend camps there, a wonderful place beside the river, in the rolling Angus hills. I would often go along on the Saturday and enjoy playing outside the camp. Quite how it happened, I do not know but he ended up as the cook. First cooking the food over an open fire until the luxury of a cookhouse and a Calor Gas cooker was provided. He took to the role with gusto and was very proud of his broth, a pride that went on through his life. Even as an old man living on his own he would delight in making broth and telling his grandchildren, "Even though I say it myself, that's a fine plate of soup!" 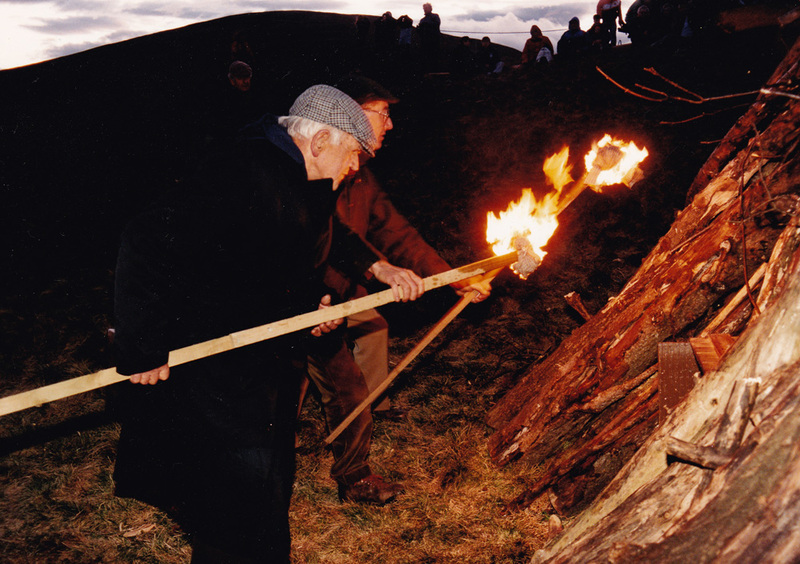 One of the often told family anecdotes involved him cooking broth at Dalbog Camp over the open wood fire. The dirty black cloth that he used to lift the Dixie cooking pots on and off the fire dropped into the soup. He didn't worry, just whipped it out. The story goes that he was commended that day for the best soup ever! 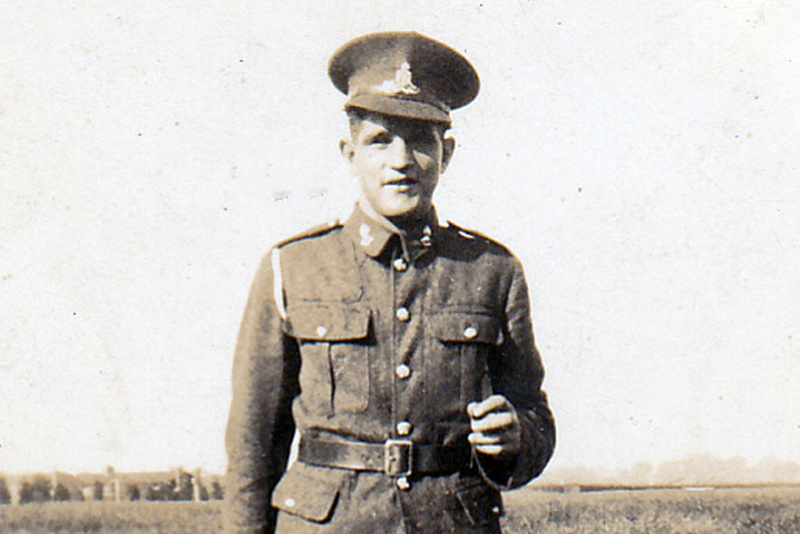 He was awarded the Cadet Services Medal which he wore with pride. 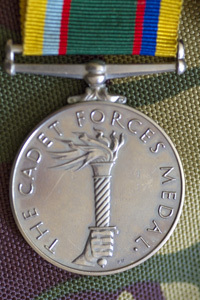 He didn't care about his war service medals, he used to say they were just posted to him, but he was presented with his cadet medal - earned it. 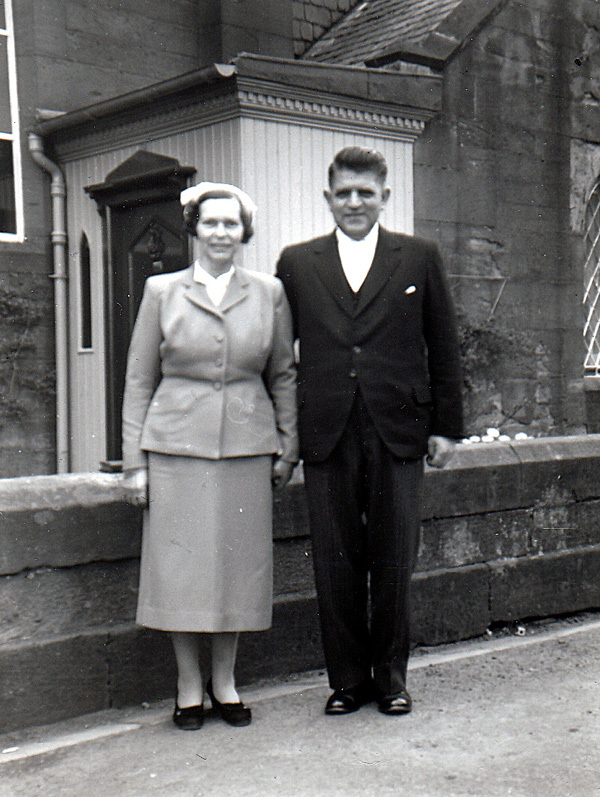 We moved as a family to Dollar in Clackmannanshire in 1961. He had been appointed Janitor at Dollar Academy, at a very significant time in the life of the school. He saw it as an opportunity for himself and his family. At that time there was no Rector at the Academy and there was little school building left after a recent fire which destroyed the main building. And things only got worse when the Prep School which was being used as temporary classroom, burned down soon after. I can still hear him out in the garden in the middle of the night looking across the school grounds to the blazing building, shouting, "Oh no! It's the Prep School!" There followed a protracted period of rebuilding – a Janitor’s nightmare. But he bore it all with fortitude and at least a public smile. How he loved that new building when it was completed and how he resented people messing up his precious new hall floor. 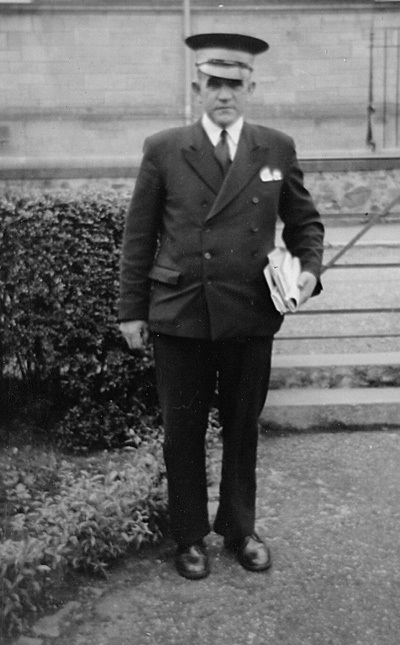 The School organised a uniform for him - a taylor-made double-breasted dark blue suit and a peaked cap with a white band round it. The suit trousers had to have a special facility: reinforced pockets to accommodate the large bunches of big keys he had to carry to gain access to the numerous building in his charge. Alf was persuaded to take responsibility for the local Fire Brigade in Dollar. The unit had a little red Land Rover with which they were expected to tackle any fires in the area until help came from the Alloa Fire Station. After two devastating fires, the Academy was happy to agree to this appointment. In these days in the 1960s, call out was by a big bell fitted in the house. I can remember numerous occasions when the bell went off in the middle of the night and my mother, always a nervous sort of person, and I would wait anxiously for him to return, often black with smoke and exhausted, but still determined to get ready for the day's work at the school. and his bell as well. 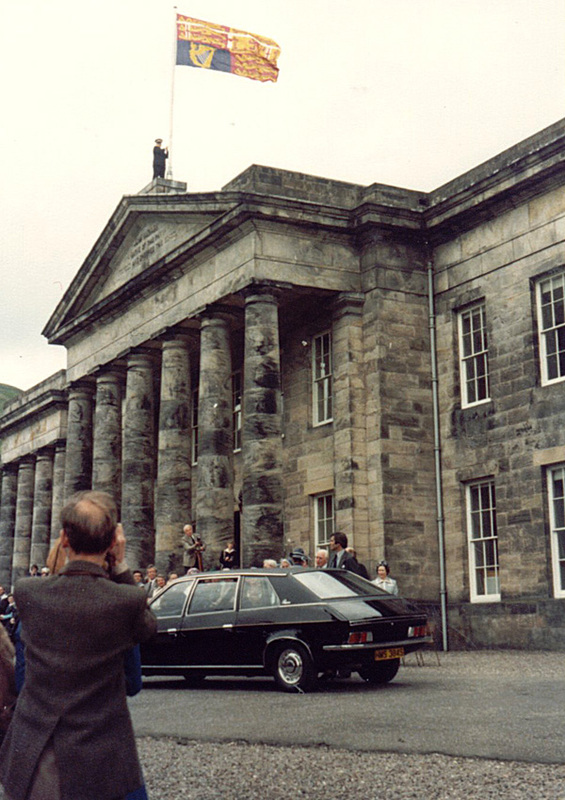 One memory I will keep of my father at the Academy was of him standing on top of the school building raising the Royal Standard to mark the arrival of the Queen on a visit to the school. I am sure that his Army service was an important factor in his appointment as school janitor in both Brechin and Dollar. Alf raises the royal Standard over Dollar Academy as the Queen arrives. 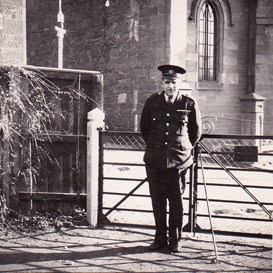 Alf continued to think of himself as a sergeant major at work too, with the rector as the Colonel. (This was literally the case in the early days in Brechin when the Rector was the colonel of the local Cadet company.) You could see the mutual respect he had for the rectors under whom he served, each understanding their role and valuing the contribution of the other. You can observe that pattern in different parts his life, never pushing himself forward but seeing his role as pivotal. He knew who was really in charge of the school, who kept the band of women school cleaners in order, and enthusiastically "urged" pupils to behave well. His relationship with Rector Hendry at Dollar went on even after Alf retired. 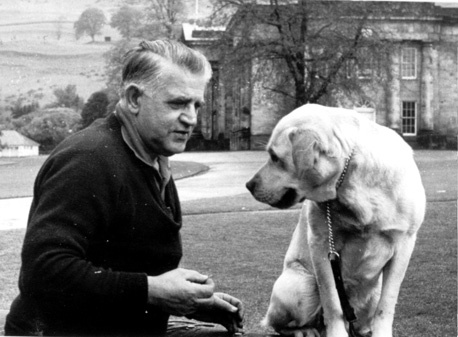 He continued to look after the Rector's garden and take Rector’s dog for long walks. 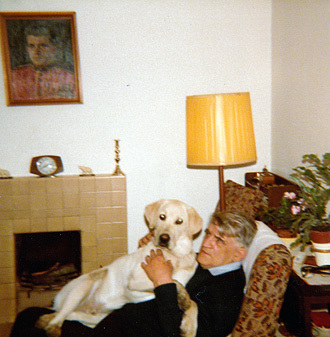 Although he never had a dog of his own, he had a great relationship with dogs. I can see the big Golden Labrador sitting on his knee! Many family dogs came for their holidays to Dollar, our own included. 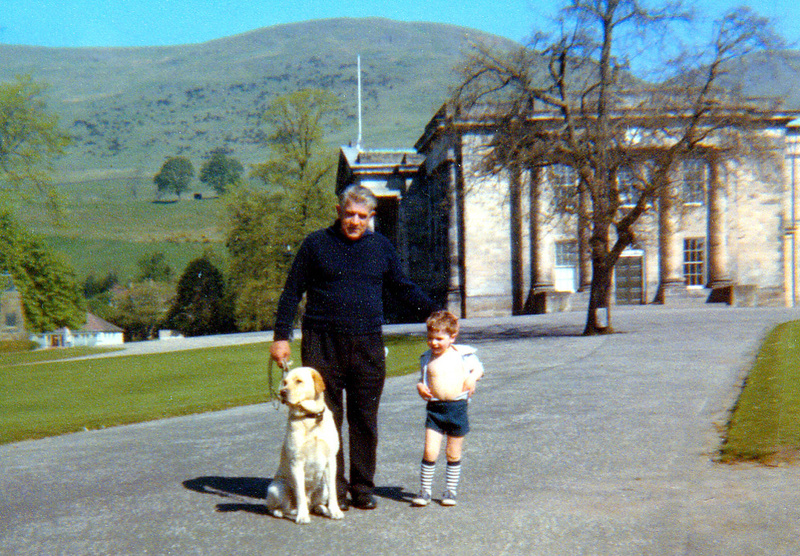 Alf loved looking after the Rector's dog. 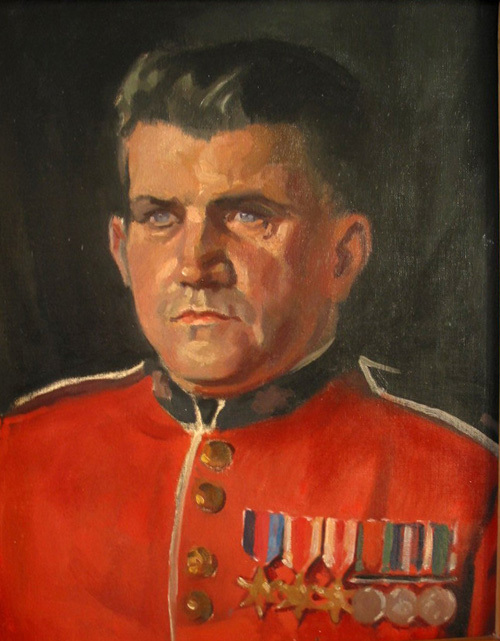 Visitors to the Janitor's house in Cairnpark Street in Dollar would see a portrait of Alf wearing a red Guard's uniform jacket and his army medals. Knowing of his army background, many assumed he had been in the Guards. The real reason for the portrait is more prosaic. Every year there was an art school held at the Academy during the summer holidays. The art teacher at the time (Ian "Pop" Campbell) would teach portrait painting, and Alf, always willing to help, was persuaded to be the class model. One year, Pop Campbell produced the Guard's uniform jacket from somewhere. Alf was presented with Pop's portrait of him from the occasion, and it hung on the wall for the rest of his life. It now hangs in the school Combined Cadet Force HQ. What you didn't see in the picture, and what can now be revealed, was that the jacket was too small for him and it was cut up the back for him to get it on. Church was always important to my father. I have seen prizes for Bible knowledge from when he was a boy in Brechin. He was ordained as an elder of the Church of Scotland in Brechin Cathedral and served in his own unassuming way on the Kirk Session in Dollar. The sergeant major again, never pushing himself forward, but always willing to help, not least in practical ways or with armfuls of flowers at harvest time. There was also the time when Dollar did not have a Cub pack and Alf agreed to take on that responsibility, despite all the other pressures on his time. Like many people from the NE of Scotland, he was not one to make a show about his quiet faith. 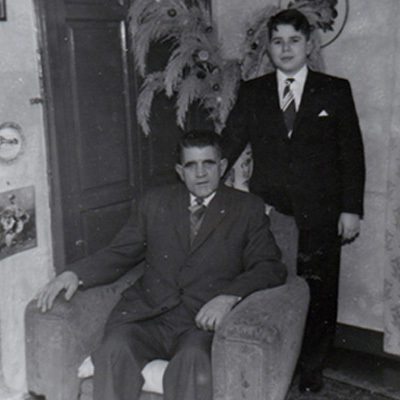 I know he was proud that his only son became a minister, an option that would never have been open to him in his day. I often wonder what he would have done had he had all the educational opportunities that he made available to me. Shortly after he retired my mother became ill and the ever resourceful Alf took on the role of running the house: cooking and cleaning were all straightforward tasks for him. 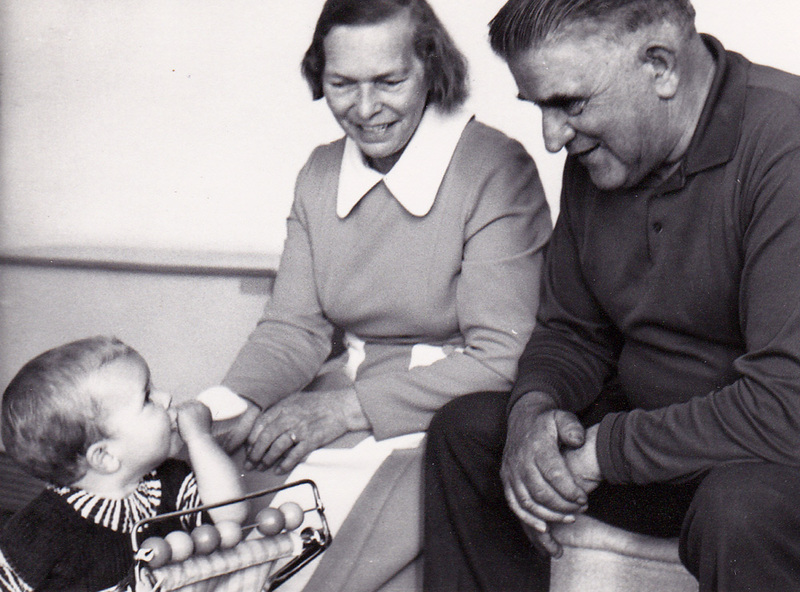 He cared and nursed my mother through her protracted illness. It was at that time that I saw a fragile side of my father that I had never seen before. I had seen him as the strong capable person that he was, but now I could see the hurt too, as he watched the approaching end of the life of the woman he had shared his life with. 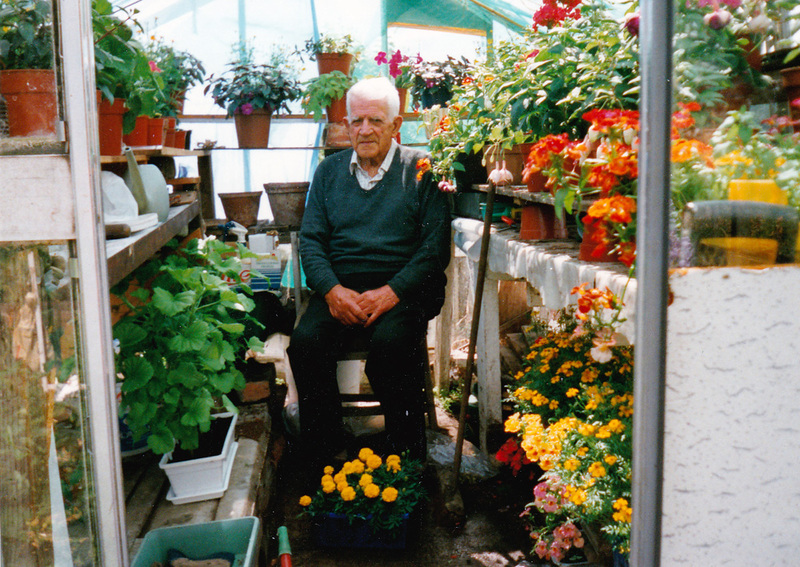 From then on he lived on his own for nearly 20 years, determined to live in his own house with the garden, at Lower Mains – and that he managed to do, thanks particularly to the support and care of his neighbours. What I haven’t mentioned yet is his beloved garden. 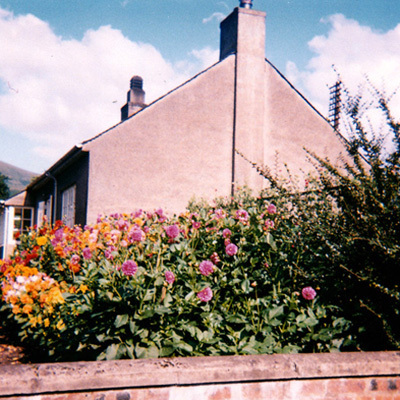 There had been a garden of flowers at Gym House in Brechin, including sweet peas, lovingly tended, and fed with a mixture of sheep droppings (collected at the Dalbog cadet camp) and water, brewed up in an oil drum. How my mother loved those sweet peas! But it was at Dollar that his passion for gardening really took off. There was always a stunning display of dahlias (kept safe over winter from frost in the school boiler house) and bedding plants in the summer. Vegetables straight from garden to table and strawberries for visiting children to enjoy. What a skill he had, and no weed would ever survive his sharp eyes. What a pleasure he gave to so many people, for he loved to share his produce. Any visit to Dollar in the growing season would see me going home with the car loaded. Retirement from the Academy saw him continuing to maintain the Rector’s garden, not to mention other people’s too. 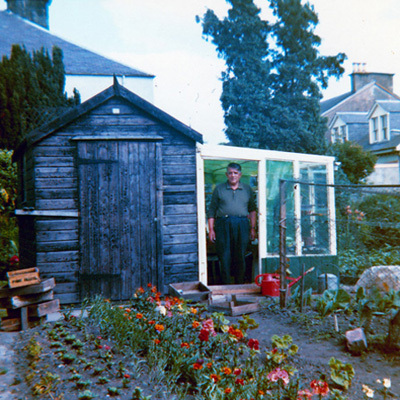 The move to Lower Mains meant that he had to begin afresh to break in a new garden, with a greenhouse that was his retirement gift from the school. 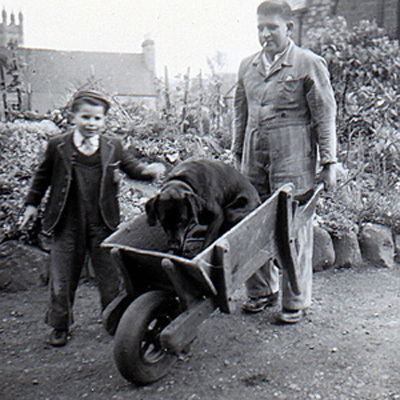 Even through his increasing frailty in old age he still was concerned about his garden and supervised (still the sergeant major) his neighbour to do the physical work. Work, garden and family were important to him, not necessarily in that order. We come from a small but close family and he kept in constant touch with his own sister until she died and my mother's sisters and brothers and all their families. He was a regular visitor to them all, often spending holidays with them, and helping out in their gardens when he was fit. Many members of the younger generation speak with affection of their visits to my mother and father in Dollar where there was an ever open door. 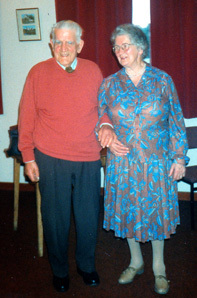 A very special day for us all was Alf's 80th Birthday in 1994. We organised a surprise party for him and we gathered together in secret, many members of the extended family. It was a very happy evening as we spent time together and reminisced, in the Castle Campbell Hotel in Dollar. You should have seen the look on his face when he saw everyone gathered there as we came in, but he took it in his stride and thoroughly enjoyed himself. It was earlier in that same month too that the nearly 80 year old Alf was driven up Dollar Hill in a tracked vehicle to light the beacon on Dollar Hill to mark the 50th Anniversary of VE Day, a fitting tribute to the old soldier who had see so much hardship in the War. Four pictures from the Brechin years. 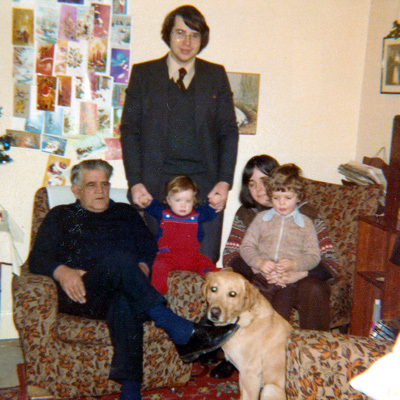 Looking back I realise that I have special memories of my father. Yes he worked long and hard hours, but there are happy memories of special family occasions he spent with me. 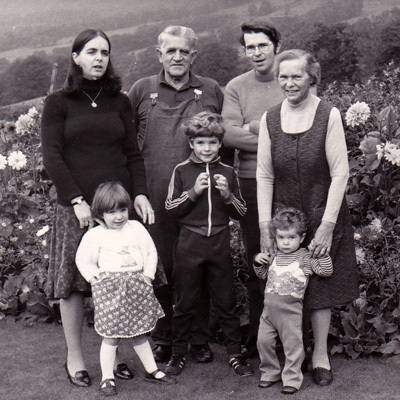 I have been looking back over some of the old family photograph and they are recorded there: time spent with the extended Smith family in Brechin; regular visits to his sister and her family on the farms round Brechin; one memorable visit to my mother's pal Cathie who now lived with her family on a farm near Kirriemuir where I was given the opportunity to ride home to the farm from the tattie field on the back of one of the enormous Clydesdale horses; visits to the beach at St Cyrus, or swimming in the river at Stannochy, near Brechin. Always willing to try things, in 1960 my father visited my Scout camp in Glen Esk and he had a go on the aerial runway we had built. But tragedy struck, the rope broke and he fell. Several weeks in hospital ensued and a back that gave him problems for the rest of his life. 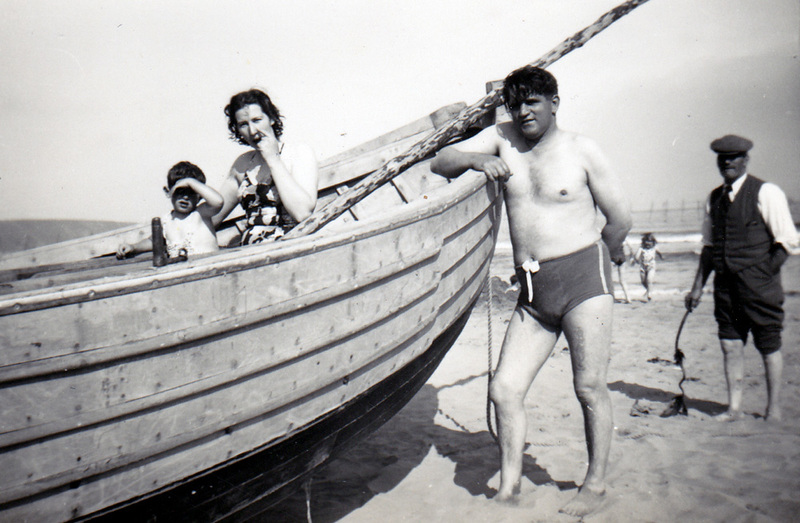 Fred, Muriel, Alf and his father-in-law Alex Smith on the beach at St Cyrus. 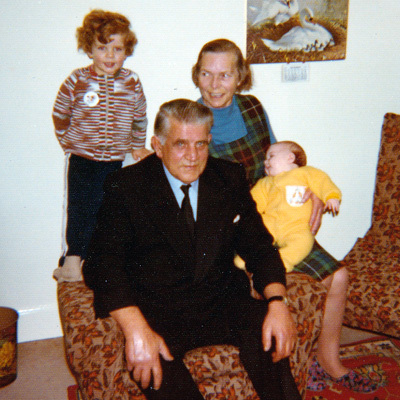 After I was married he was a regular visitor to Mary, our family and me: summer holidays in Buckie, or Aberdeen, enjoying time spent with grandchildren watching them growing up. 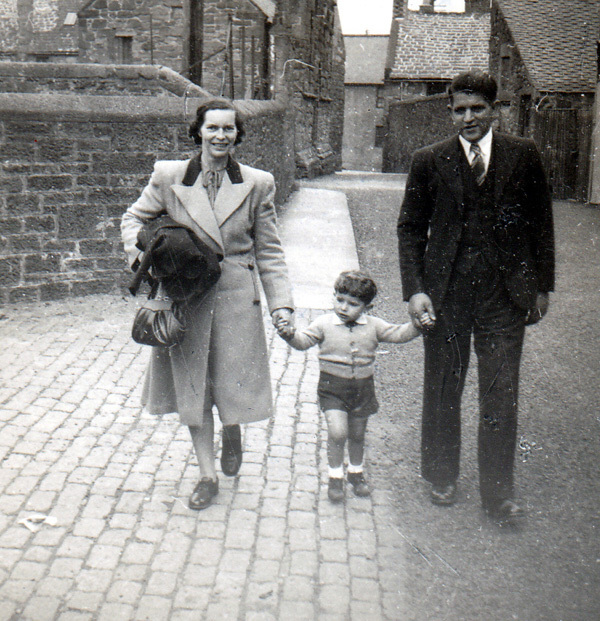 My mother and father even made a long and difficult journey through appalling weather from Dollar to Buckie to attend the baptism of our daughter Rosie. And he would sort out my garden. 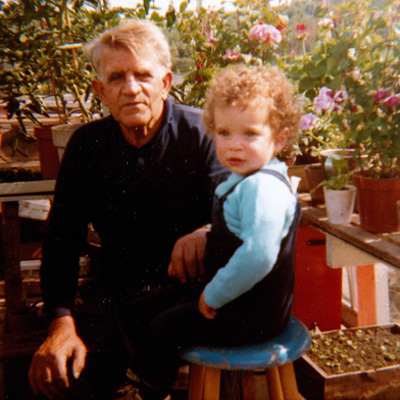 (I never did inherit his skill and enthusiasm for gardening!) Then there were Christmas visits too, right up to the year he died. 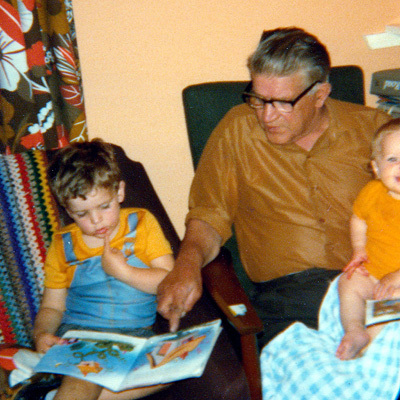 He was always interested in his grandchildren, and although not a demonstrative man was always proud of their achievements as they grew up, and would display their photographs with pride in the house. He delighted in them visiting him in Dollar and was always willing to give his opinion to them on any subject. He was generous to a fault, when, in his latter years, he had the new experience of having more money that he needed. 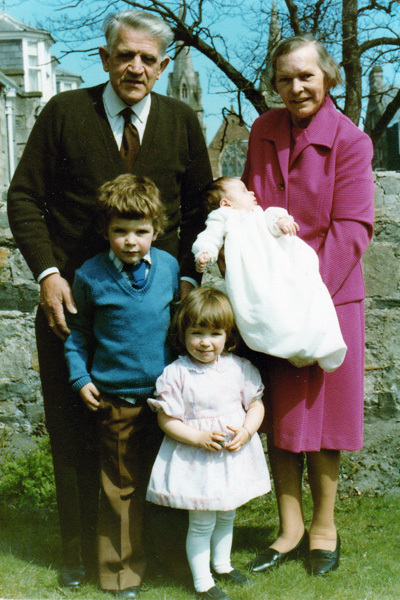 Alf and his grandchildren, Donald, Rosie and David. Growing frailty over his last few years, with the pain of arthritis, dullness of hearing and diminishing sight, saw him draw in a little. Instead of the long walks that he would make with the Rector’s dog, or the many other dogs who came for holiday visits, television became a pass time. He was the first person I knew who had Sky Digital and him virtually blind. But he still managed to get pleasure from the sports channels – watching cricket or football with his nose 12 inches from the screen. But he seemed to know what was going on. A real discovery for him was talking books which he would read voraciously, first from the local library, and then from the Talking Books which were sent by the Royal National Institute for the Blind. When he was on form he could get through one a day and would delight in telling you all about it. Alf always stood to attention for photographs. (And he never did wear a kilt!) with David and Donald. As I sat with him in hospital through the last night of his life I reflected back over his life and realised what a wonderful and varied life he had had. I have learned so much from him and I am like him in many ways. I have the same stubbornness, and commitment to work and helping. Although we probably never said it to one another, we did love and respect one another for the different people that we were, but very similar people too. Opinionated, stubborn, he may have been. but he was kind and committed. 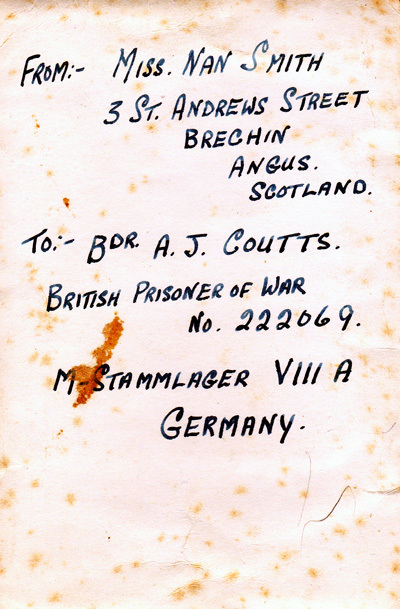 People liked him: "Affa fine laddie, Alfie"
Fred Coutts writes about his father, Alf who was a regular solider, a prisoner of war and a school janitor.